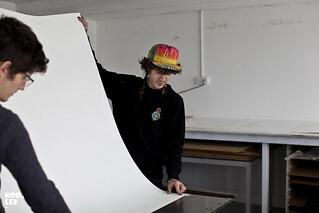 American street artist Gaia has landed in London, ahead of his upcoming show "A Show Of Hands" with East London gallery Nelly Duff. 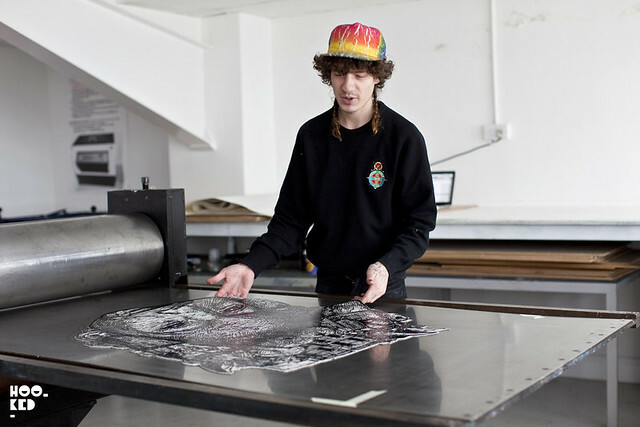 Hookedblog were lucky enough to hang out with Gaia for a few hours yesterday afternoon as he was working on a new Linocut edition for this London show. 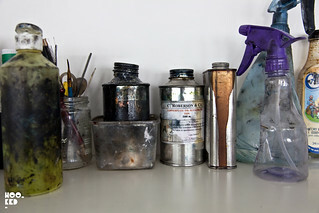 We left the familiar stomping grounds of East London and jumped on a train to Zone 4 in South London to catch up with Gaia in this South London print studio. 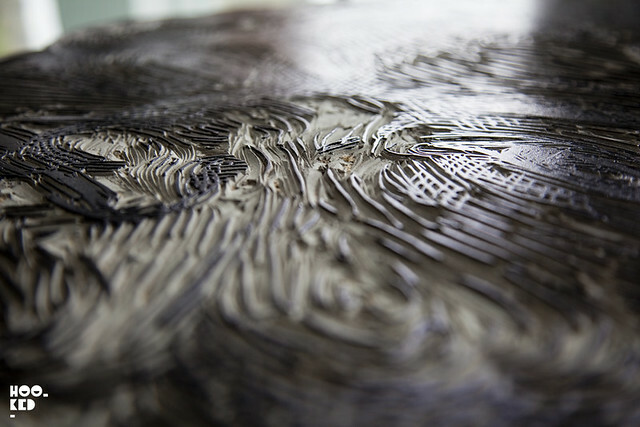 When we arrived Gaia had already completed carving the 'Marlo' image into what is probably the largest piece of Lino we have ever seen and he had begun to ink up the Linoblock. Despite us getting a little lost en route it looked like we had timed it perfectly as he was about to start printing on our arrival at the studio. 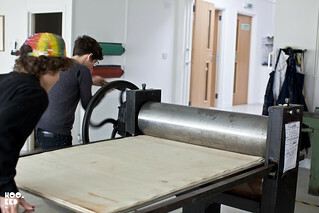 Gaia inking up the finished linocut block with a roller. 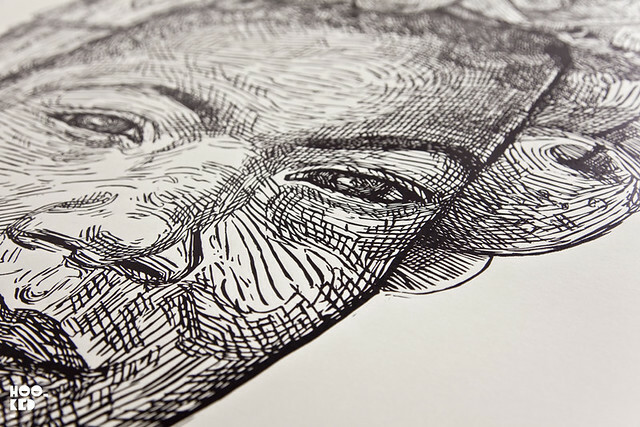 Close-up shot of the image gouged into the linocut block. 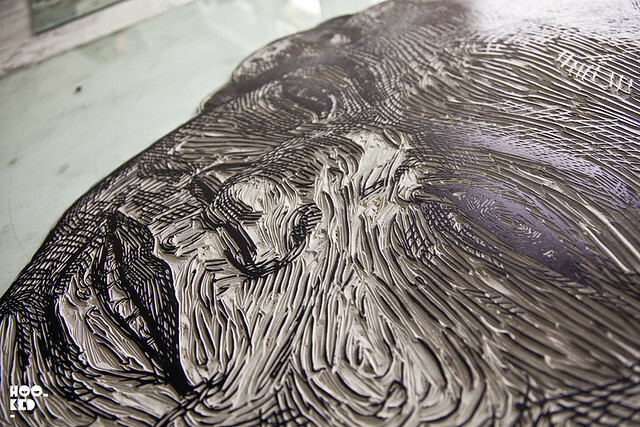 The inked linocut block is then positioned on the press, ready for the sheets of paper to be placed on top before both are run through the press. 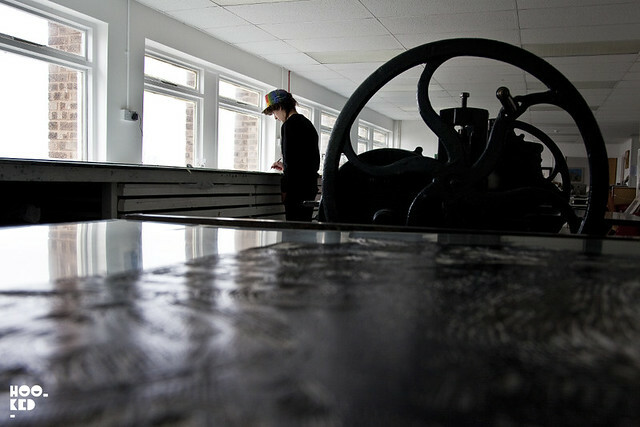 Having run the inked lino block through the press, the image is impressed onto the paper, which is then transferred carefully onto the drying racks to allow the ink to dry. 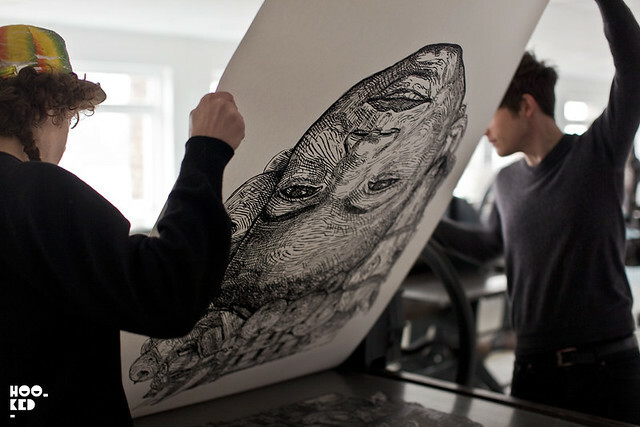 Once the print has dried Gaia signs and numbers the finished print to complete the edition. 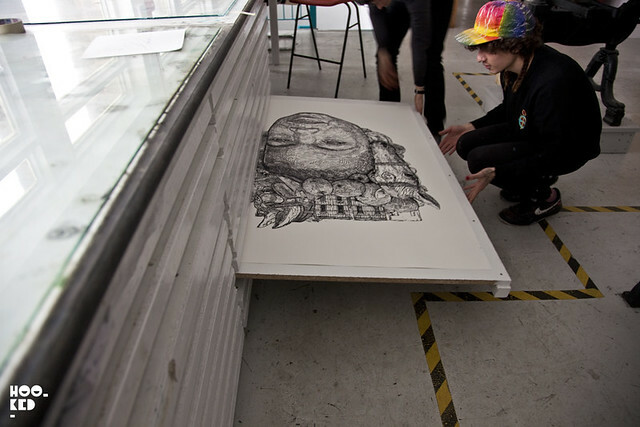 Below, Gaia hold up the finished lino print and as ye can see from the picture the new edition is massive! This stunning new 'Marlo' print edition is now finished and the print is available for purchase online directly from Nelly Duff's website here or in the gallery if you happen to be in London. It's always a joy for us to see artists at work and we very much enjoying getting a run through of the Lino Printing process from Gaia. 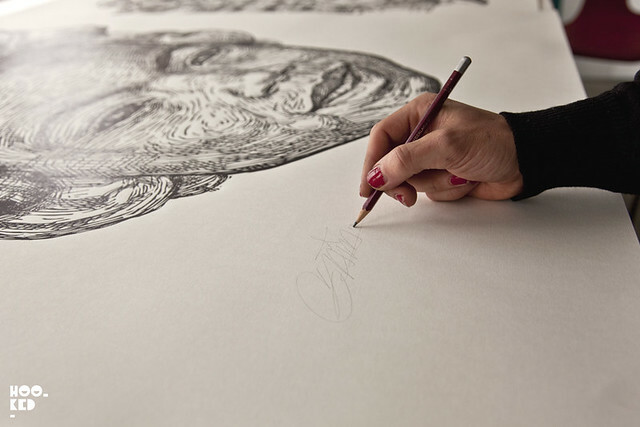 You suddenly realise how much work, effort and love goes into these beautifully handcrafted artist editions. Within the few hours that we were in the studio Gaia and the print technician only managed to print a tenth of the 100 print edition. We never realised that Lino printing was such a long time consuming process but we think you'll agree the end result is worth all the effort. With the edition complete Gaia will now focus on the upcoming show which we are looking forward to and hopefully he will also find some time to hit the streets again on this visit. Details for the show are below, be sure and RSVP and we will see you all there. 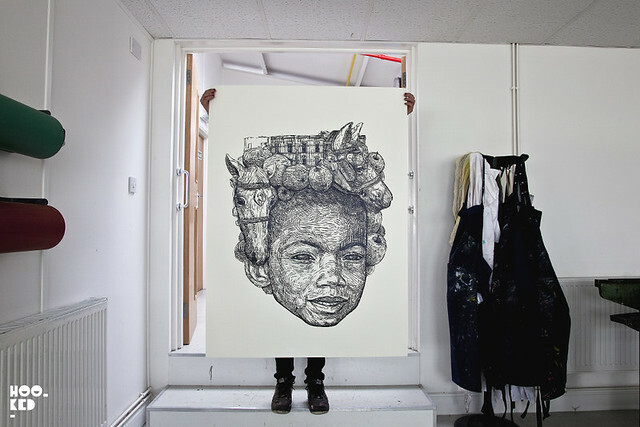 Gaia's "Show Of Hands" opens with a preview on the 11th April, 6 — 9pm.